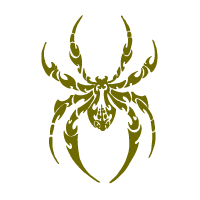 The spider symbol meaning creativity and it often believed to link the past and the future. Many traditions consider the spider as the weaver of the fabric of life where they introduce both writing and the making in clothes. All over the world few cultures do not have mythical stories about spiders this is because the spiders can be found nearly everywhere in the planet. This can be as far as even on far-off islands. The spiders can travel long vast distances using their webs which are fascinating. The fascination is also eminent in the web’s ability to capture prey. In America storytellers composed myths of a spider woman who was present at the dawn of creation before humans were created. The spider woman taught people how top weave. In the recent world it is a symbol of fertility¸ harmony and balance. The spider in the Native American clay carvings which was drawn with a cross carved on its back symbolized the centre of the earth with its four cardinal directions. The Spider symbol is associated to creativity and cunning always seen when the spider is dangling at the end of its thread. The symbol here will therefore be a sign of good luck because different communities think that it is bringing down joy from heaven. Amongst weavers it is a symbol of their craft. Spider is associated negatively in Europe because it is associated to hangover from the days of the Plague where it was thought to have spread the disease.